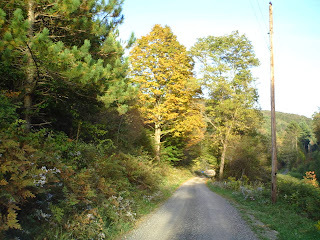 The leaves are falling and frost has been on the ground four times. It started the first week in September a bit soon even for us. No hard freezes though so most of the plants are doing fine. I am enjoying the quiet lack of construction in my yard and walks in the crisp air. Sounds like some sort of singles ad. Ha. Good news for the people of Leetonia who have not enjoyed the trailer in front of Pettites. It has been given to me to scrap out. A friend of mine will be doing it over the next couple months. All that should be left is a lot. The lady who owns it doesn't want to care for anything else and is leaving it vacant. She has said that if any of you want to use it to park a car once the trailer is gone...she would appreciate it if you could keep the weeds mowed down. Phil and his friends will be doing the scraping and while he is there if you see something you need be sure to ask him. Otherwise help him out. If you see someone else taking valuable scrap. Let me or him know. Most the stuff inside is being given directly to people in need. I am cleaning the dishes and bedding up for a family who just had a house fire and lost everything. Not a lot else happening right now. Just watching the color change day by day. It is always so beautiful. Mountain girl, Paula, logging out. The string of events started by Fred Espenship who now lives in Evergreen, Colorado. He found the blog and sent the link to his Aunt Fran Weigley who lived in Florida. Fran was 85 when she started reading my blog in late 2007. 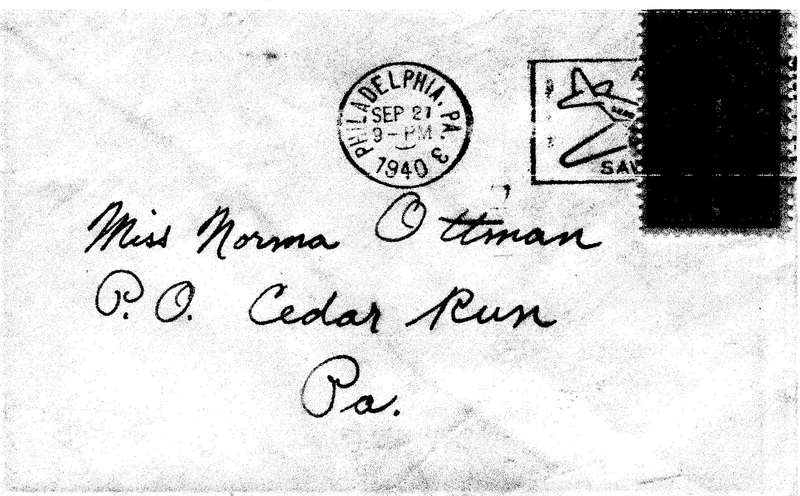 She had a deep connection to Leetonia as her Dad, Norman Ottman was a CCC Foreman starting sometime after 1929 and I am unsure of how many years they lived in Leetonia total. But they lived in what she called "The Square Camp", which is Cassel's Red building on the side of the mountain. Her dad, lived there rent free and supplemented their diet with quite a lot of deer meat. They then moved to what many know to be the "Herre Camp" and is now "Steele Waters." 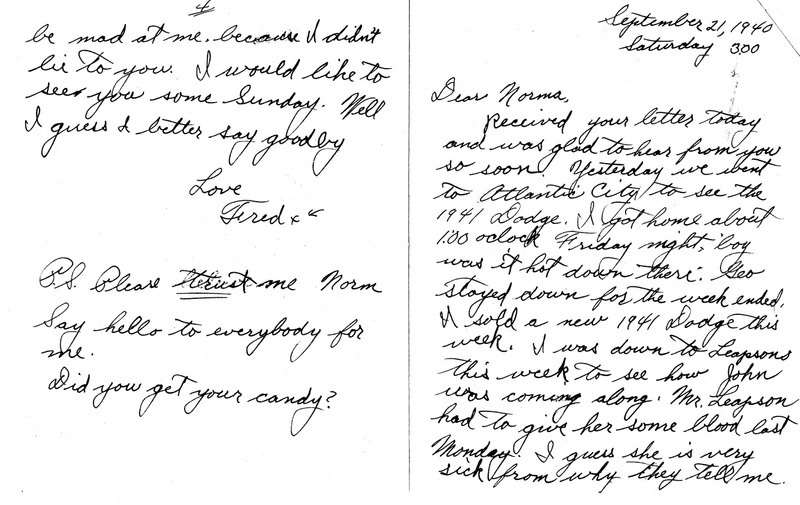 Fran had one sister named, Norma, who was Fred's mother. This link shows a picture of Fran and Norma Ottman. At 85, Fran was not afraid of new technology and followed the blog, emailing me information she thought useful, including several pictures of her family in Leetonia. If I failed to post on a regular basis she would email me to make sure I was alright. She even learned how to scan old pictures and send them to me. The one with her mom, Beatrice, feeding the bear a bottle is one of my favorites(see link). The one thing I have noticed about people who used to live or even have a camp in Leetonia is they always have fond memories of this place. Those who have lived here know how hard it is to make a living here and survive what mother nature dishes out. In July of 2009, my interaction with this family would take an interesting turn. 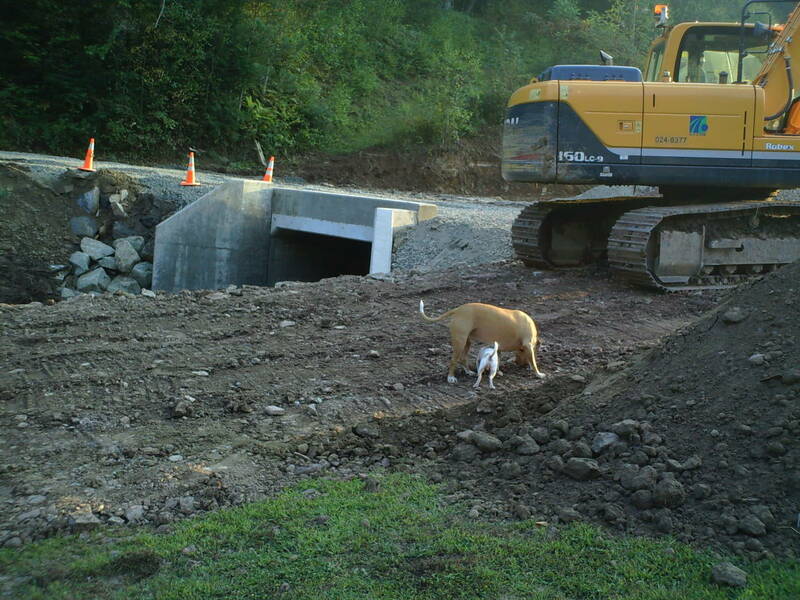 I do a lot of construction work on the places in Leetonia and that summer I worked on the old "Herre Camp". We replaced windows, painted and replaced all the floor coverings. We pulled up the old carpet upstairs and saw a letter wedged between the carpet and the floor. 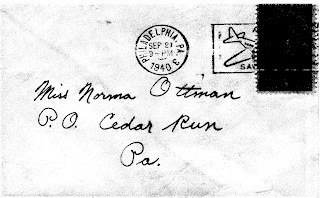 The letter postmarked, Sept 21st 1940 and it was addressed to "Miss Norma Ottman". Norma was the mother of Fred Esphenship. (Original blog story about finding letter). You can imagine my surprise in finding such an old letter, yet alone knowing the son and sister of the person addressed. What are the odds such a thing could happen? I opened the letter, which I have transposed here and read it with great interest. 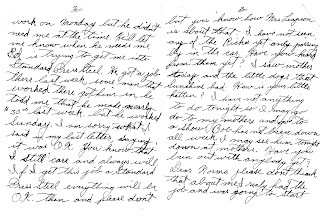 The original is also scanned, and I have included it as well, but I thought it would be easier to read this way, since it was folded and in cursive. Received your letter today and was glad to hear from you so soon. Yesterday we went to Atlantic City to see the 1941 Dodge. I got home around 1:00 Friday night, boy was it hot down there. Geo stayed down for weekend. I sold a Dodge 1941 this week. I was down to Leapsons this week to see how John was coming along. Mr. Leapson had to give some blood last Monday. I guess she is very sick from why(what) they tell me. But you know how Mrs. Leapson is about that. I have not seen any of the Ricks yet only passing by in the car. Have you heard from them yet? I saw mother today and the little dogs that Sunshine had. How is your kitten? I have not anything to do tonight so I may go to my mothers and go to a show. Bob has not been down all week I may see him tonight down at mothers. Have you been out with anybody yet? Dear Norma please don't think that about me, really I had the job and was going to start work on Monday, but he didn't need me at the time. He'll let me know when he needs me. Ed is trying to get me into Standard Press Steel. He got a job there last week some man who works there got him in, he told me he made nearly $30.00 last week, but he worked Sunday. I am sorry what I said in my last letter saying it was O.K. You know that I still care and always will. If I get this job at Standard Press Steel everything will be O.K. then please don't be mad at me, because I didn't lie to you. I would like to see you some Sunday. I guess I better say goodbye. P.S. Please trust me Norm. Did you get your candy? 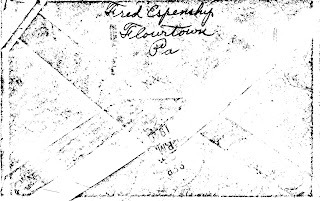 The person writing this letter is Fred Espenship who is the father of the Fred Espenship who forwarded my blog to his Aunt Fran. 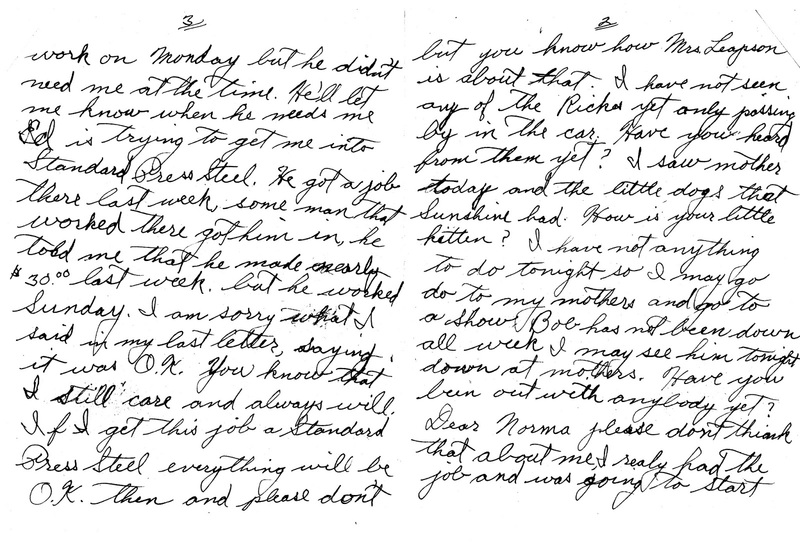 The letter is to his mother Norma, so it became obvious that their relationship continued and they got married. But why is the letter under the carpet in a hallway? Was Norma hiding it from her parents or just saving it and forgot about it? I am afraid we will never know. 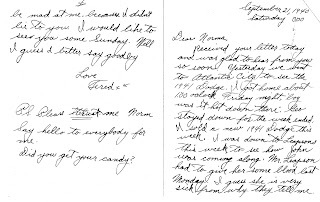 Norma although still alive when I found the letter, memories had faded and could not remember the letter. One thing is for sure having a good job to get the girl was important back then. I think impressive jobs and money still get the girl today, but we just don't talk about it. I am not sure if Fred stretched the truth about a job he didn't have to make himself look good, but he was determined to make it up to Norma. Whatever he did it must have worked. He got the girl, Fred was born, read the blog and forwarded it to Fran. 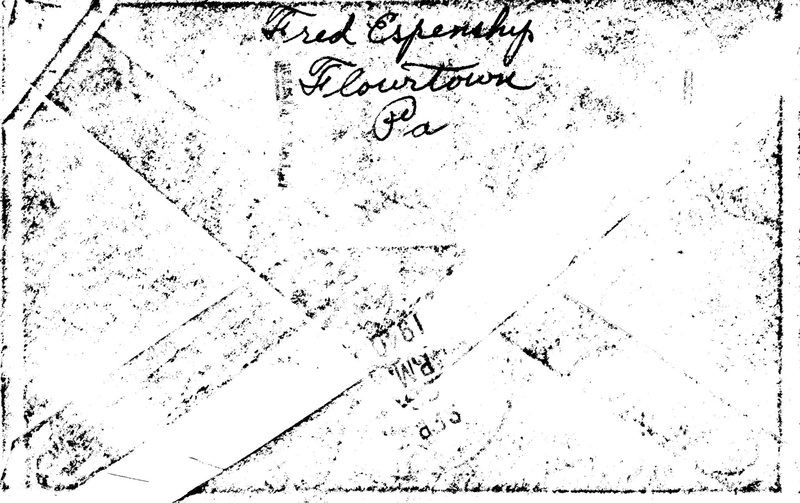 Then sixty-nine year later: I ended up living in Leetonia; writing a blog making connections to the past; remodeling Norma's childhood home; tearing up the carpet to find the love letter. Amazing. Life is a great process of discovering mysteries and it is never dull even in a place as remote as the ghost town of Leetonia. The road is open through the bridge project on Leetonia Road past my house. 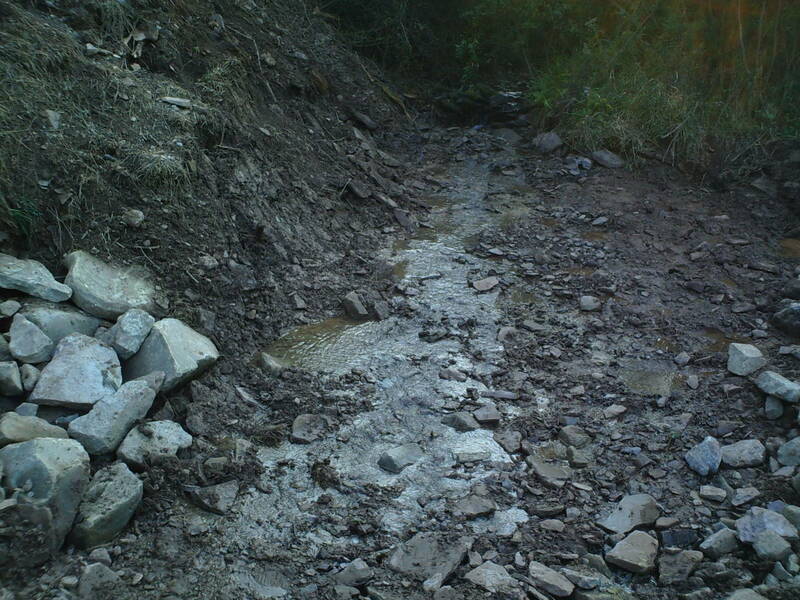 They don't have the guard rails up so if you don't turn you will be coming up my driveway or going into the creek. 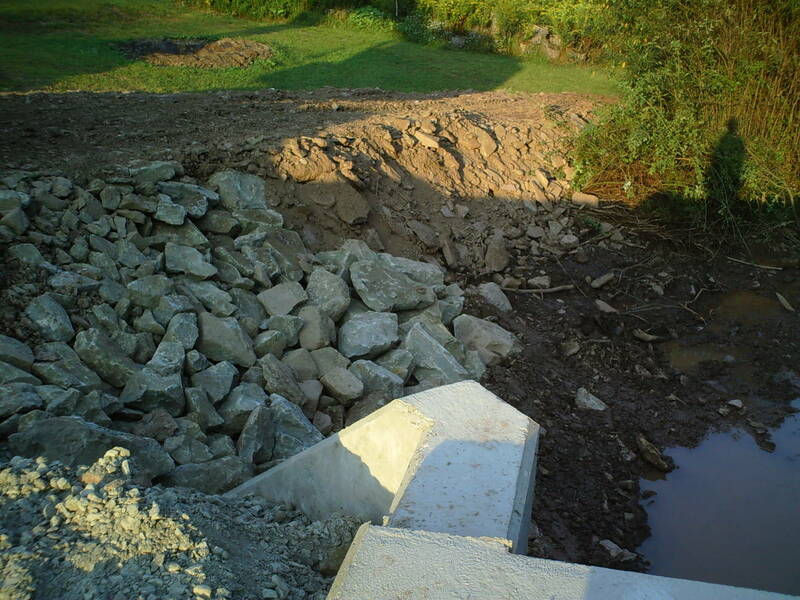 They said they may not get guard rails up until Spring. Right now there are cones and reflectors which blink all night. 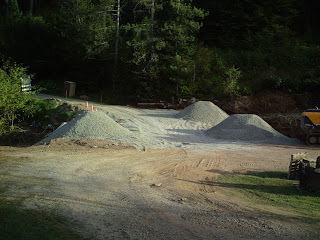 They seeded the part of my yard they tore up yesterday and no sooner than it was finished we had a downpour that tore little rivers through it so it isn't looking too good this morning. Not sure if they will repair it or that is on me. Some of the equipment is still here as of this morning, but it may be leaving today. I didn't get home until 10 pm last night and came home to a dark house. The storm took a tree down and the power with it. Around 10:30 pm I saw the power truck go by and thought it would be back up soon so I went to bed. I woke up at 1:30 am to notice still no power. So I called again. They thought they had it fixed. So it wasn't until 5 am the power came back on and turned all the lights and TV on that was on before the power went off. Since I had to get up at 6 am my sleeping by the time I turned everything off my rest was over. At least I have water and the refrigerator is cold this morning. Well, just this short note for all you coming up. No More DETOURS around Leetonia Rd. Yeah! Mountain girl, Paula, logging out. Although, the bridge work isn't completed, they pulled out the horrible pump and the woods has returned to its natural silence, at least at night. 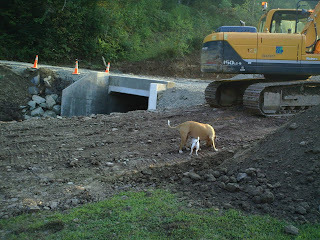 Over the weekend they made it so I could cross the bridge and save the ten mile detour. I imagine it will be the same again this weekend. They still have some finish work to do. 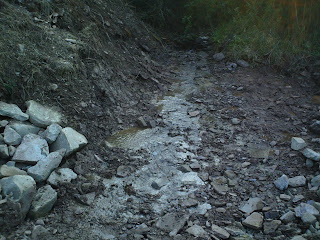 Most of which is in my yard damage and driveway. The way the road looks right now people would tend to drive into my driveway easier than going down the road. I am just happy not to hear the pump noise and breathe all the diesel fumes. Unfortunately, it didn't happen fast enough to save me from bronchitis. I have been coughing for 4 weeks and finally had to break down and go to doctor Saturday. Hopefully, between the antibiotics and the better air quality my breathing will return to normal. I will post again before the weekend to let you know if they keep it open, but so far it is only closed while they are working from 8 am to about 3 pm. I feel like I have my own bomb shelter as big as the bridge turned out. I think it will be here long after everything else is gone. On the weird news side, last week there was an unfortunate incident on the other side of the mountains near Marshlands where Leetonia Rd. connects to Elk Run Rd. It seems the Gaines Township road guys were working when a pipeline worker passed the grader doing what they said was 70 mph. The grader came to a complete stop for fear of a collision and the other worker, Randy, attempted to stop the vehicle and take the driver's information. This is were everything went wrong. The driver didn't want to give him the information so Randy punched him and the guy took off dragging Randy and leaving him in a broken, bloody pile on the road. Shortly after mobile alerts blanketed the area with a description of the vehicle and its two occupants. They found the guy who hit Randy. He claims he feared for his life, however this doesn't explain why he didn't stop after nearly killing Randy or call after he got a distance away. Randy had severe face damage and several broken bones. He was air-lifted out, but from what I understand is now at home recovering. I am not sure how this will play out in court. The hit and run person has no excuses, but not sure Randy will come off totally clean for punching him. This just shows you that using force to get justice can get you into trouble. Never a dull moment even in the middle of the woods. Mountain girl, Paula, logging out.